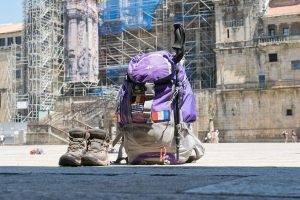 When planning the Camino many pilgrims struggle with what they should bring with them, what they can find in Spain… Do you know what things to pack for the Camino de Santiago? 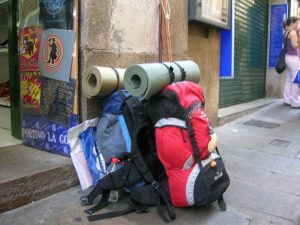 Here is our Camino de Santiago packing list! 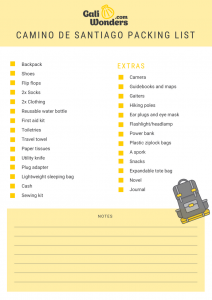 And keep reading until the end, because we have made a printable checklist with all the necessary items for your convenience! These are the items that we recommend you take, but of course, feel free to modify this list according to your personal needs and your travel plans. The backpack you should choose depends on whether you will carry everything with you or have your luggage transported. Whether you only need a daypack or if you are planning to walk with all your belongings, remember to pack light! A rule of thumb for the Camino is to only pack 10% of your weight. Whatever you do, it is important to get practice and wear your backpack with as much weight as you intend to carry. And don’t forget to get a backpack with hip straps, they help redistribute the weight across your body, so that your shoulders do not suffer as much. 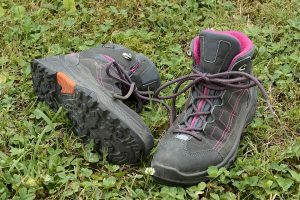 The type of shoe you should choose for the Camino depends on how much you are going to walk and on the time of the year during which you will travel. 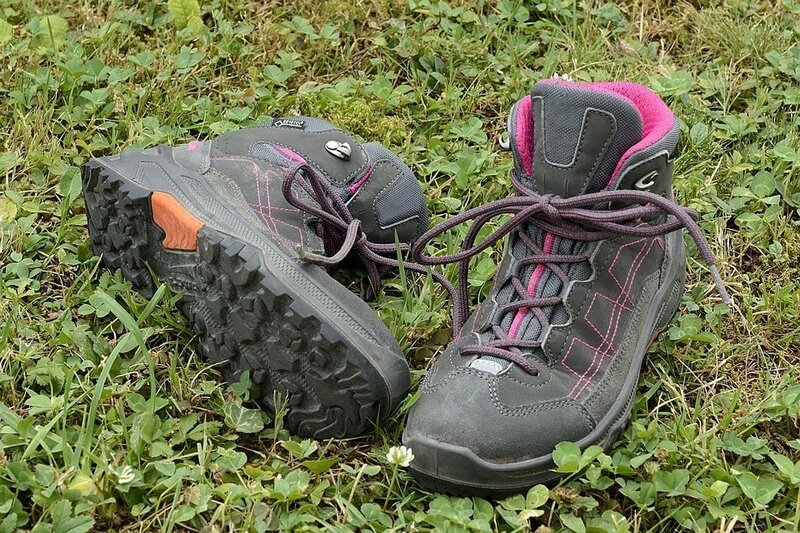 You can wear tennis shoes or hiking boots, but make sure they are broken in and that you are comfortable with them. As with the backpack, you should get as much practice as possible. Also, keep in mind that even in summer, you can encounter rainy days, so it is best if your shoes are waterproof. Do not forget to bring flip flops for showers if you plan to stay at an albergue, and an alternative shoe for when you are done walking for the day (whether these be the flip flops or a third pair of shoes). Good shoes are one of the key items for the Camino, but socks do not fall far behind. If you are going to splurge on anything, it should be socks. Good quality wool socks will keep your feet protected. We also recommend that you bring sock liners. In case you are staying in an albergue, your socks should also dry quickly, or you could bring extra pairs if you don’t mind the weight. The perfect clothing for the Camino should be lightweight and made of a material that dries fast and will not chafe. To avoid unnecessary weight, it is best that you take two outfits, wash them overnight and swap them out. But if you want to send your luggage from accommodation to accommodation you can be more lenient. Most hotels will have a washing machine, but if you’re staying at al albergue, do not forget to bring soap to clean them. We also recommend that you choose clothes that allow layering, to account for the changes in temperature along the day. 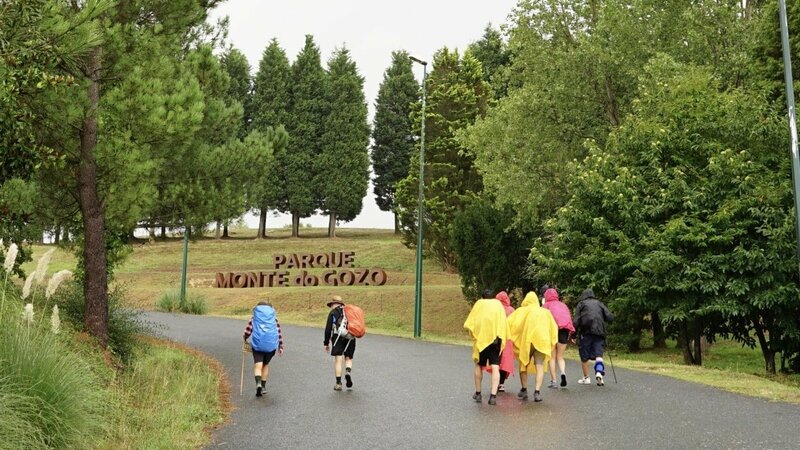 If you are planning to walk during a rainy season, you can buy specific waterproof clothes for your Camino. But if you do not find it necessary, it is still advisable that you bring a rain poncho to cover yourself and your backpack, sometimes Spanish weather can be treacherous! Sunscreen is essential no matter what time of the year you are walking the Camino, so don’t forget to bring a bottle! You should wear sun protection even if the sky is overcast, and reapply several times a day. We also advise that you bring sunglasses and a visor cap or hat if you are specially sensible to the sun. You will have many opportunities to refill water in fountains alongside the Camino, so a reusable water bottle is your best option. There are two Spanish expressions that you will need to learn: Potable (water safe for drinking) and No potable (unsafe water that you should steer clear off). There will be many pharmacies along the way, so if you forget to bring something or you come across an unexpected problem you should not worry. However, it is always best to pack some essentials and have them with you as you walk. Compeed is a treatment for blisters that you will be able to find in any Spanish pharmacy, but it is good to have it with you when walking. To help prevent chafing and foot blisters. Take with you any prescribed medication that you use on a daily basis. You should also take some general over the counter medicines such as painkillers. Whilst you will be able to find these in any pharmacy, it is advisable to have some to relieve muscle pain, headaches… such as ibuprofen, paracetamol or aspirin. 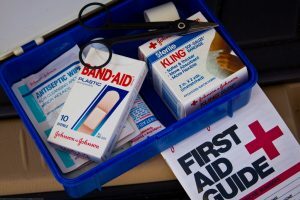 And do not forget to include plasters, rubbing alcohol, bandaids, safety pins, scissors and tweezers. Take travel sized versions of the basic higiene products you use on a daily basis: soap, shampoo, deodorant… You can also bring chapstick and moisturizer to keep your lips and skin on their best condition. But always keep in mind the weight you will be carrying. If you are staying at an albergue or a hostel, a body towel that takes up little space and dries quickly is a must. If you are staying in private accommodation with a private bathroom, you will not have to worry about bringing a towel. You should carry paper tissues with you on your Camino, and if you are staying in albergues we advise that you take some toilet paper with you. Wet wipes will also be useful if you need to clean your hands in the middle of a walking stretch. An utility knife or swiss army knife may come in handy on your Camino if you need to cut any food packaging, open a bottle, etc. Spain operates on a 230V supply voltage and 50Hz and plugs have two round pins. If your country uses different plugs or voltage then consider bringing an adapter to charge your electronics. If you plan to stay on an albergue you will need a sleeping bag. Try to find one that is as light as possible if you are going to be carrying all your belongings with you. You may not find an ATM in every town you visit, and some places will not accept credit cards, so try to always have a few euros in cash. 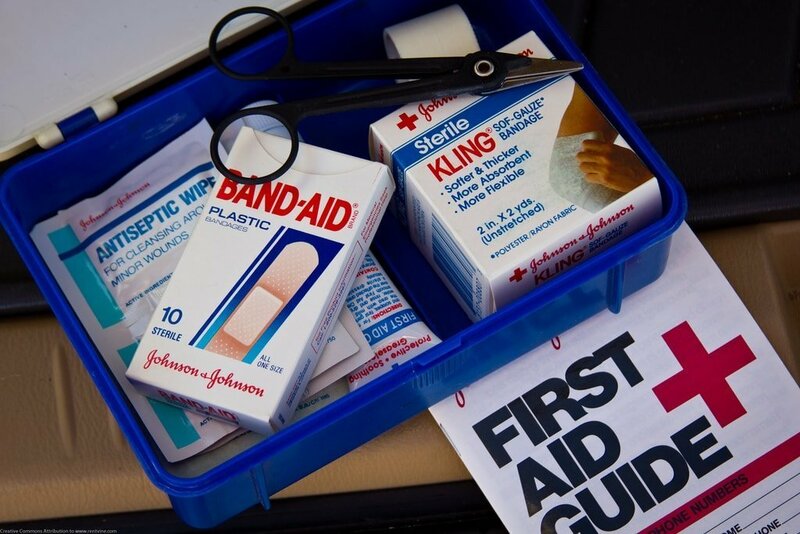 A sewing kit will be useful to patch up clothes and also to deal with blisters. Here are some optional things to pack for the Camino de Santiago. These items may make your experience better, but you will need to consider if all that extra weight is worth it! 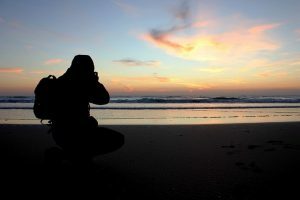 Nowadays, if you want to take pictures, a smartphone will do, but if you are into professional photography you may want to bring a camera with you to document all your Camino experiences. The Camino de Santiago is well signaled and there are many phone apps that will serve as guidebooks or maps without the extra weight, but if you like having these items on paper, there are many excellent guidebooks on the Camino de Santiago and its trails. Gaiters can help protect your legs from the mud, but they will probably be unnecessary in warmer months. Hiking poles can help you redistribute your weight as you walk, but they may be hassle to bring and to carry. If you are unsure whether you’ll need them don’t worry about bringing them from home, they’re widely available along the Camino. If you are a light sleeper and are planning to share a room in an albergue, these two items are a must. Nowadays, most smartphones come with a flashlight, but you may want to bring an extra light for early morning walks. In case you cannot find a suitable plug or run out of battery while walking. Useful for food, wet clothes, or keeping your documents dry. If you want to eat along the way without stopping at a restaurant but are tired of bocadillos, you can always get something at a supermarket and eat it with your spork (although most to-go options come with a plastic fork or spoon). You will be able to find food on your Camino so we do not recommend you take the extra weight, but if there are any snacks that you cannot live without do not hesitate to take them. To carry some of your items in the afternoon, as you get to know each town. Or an e-reader, for your free time in the afternoon. To document your journey. You may become inspired during your Camino! We hope that this list has helped you decide what to pack for your Camino. And don’t worry if you forget anything, we are sure you will be able to find everything you need in most Spanish towns. 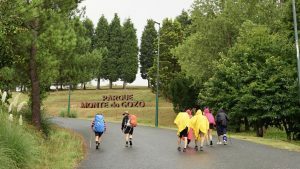 Planning to walk the Camino? Do not hesitate to contact us! 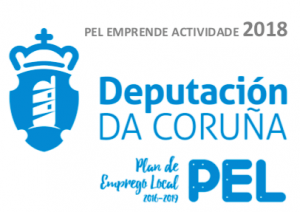 We are local Camino experts based in Santiago de Compostela.